5 Reasons To Get That Tree Stump Removed | Mr. Tree, Inc.
How Does Epsom Salt Work On Tree Stumps? Many homeowners have dealt with the problem of tree removal, which doesn’t always end when you cut down a dead tree. Even with the tree gone, the stump remains and removing said stump is a wildly different process – often more difficult and costly than the actual cutting of the tree. For this reason, many people choose to forgo the removal of the tree stumps entirely. There are even whole farms (called stump farms) which are planted around the stumps of trees which have been cut down. Property owners often attempt the same thing, they try to plant new trees around the stump. Otherwise they try to repurpose or ignore it altogether. Sometimes this is viable, but you must consider the possible problems that can occur when you leave a tree stump in place. Here are the five reasons why it’s a good idea to remove the stumps of fallen trees. A stump left in place will begin to decompose, eventually breaking down completely. This process, however, is extremely slow and messy. The decomposition process is aided by a variety of microbes and other organisms, all of which will start appearing in the stump as soon as the tree has been cut down. Commonly, ant species such as carpenter ants will move in and begin constructing nests inside of the stumps of your fallen tree. These ants can then begin to appear everywhere else around your home which can lead to a serious pest problem. In addition to ants, termites love tree stumps as do other insects that feed upon wood. They often won’t just keep to the stumps and will spread to other plants around them, including other trees, shrubs and possibly your home itself. There are other species of plants that can often take hold upon tree stumps. Other trees can begin growing from the remains of the old tree, but these are often small and unsightly and extremely difficult to remove. In many cases, the invasive plants that grow on your tree stump require chemicals to be destroyed completely. This isn’t ideal as it can be harmful to the other plants in the area you’re trying to cultivate. Fungi like mushrooms can also sprout all over the tree stump, which are also often unsightly and potentially dangerous to pets. Besides their propensity for attracting unwanted species, tree stumps can also be a safety hazard if left on your property. They can provide tripping hazards to children playing in the yards, and since they are solid wood a person tumbling onto one can be seriously hurt. Anytime you are attempting to do any sort of yard work you will have to deal with the stump, taking care to avoid it when you’re mowing your lawn or pulling weeds in your yard. If a lawnmower makes contact with a tree stump, then there is a possibility of doing severe damage to the machinery, creating another possible safety hazard to yourself and anyone else working in your yard. 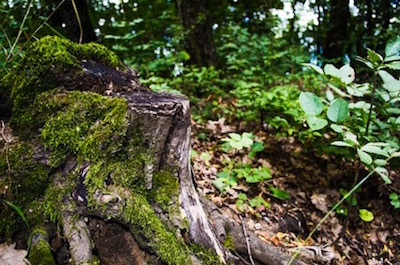 You can risk pushing your property values down if you leave stumps on your property. After all, they’re not exactly attractive to look at and potential buyers may be wary of a home that has unsightly stumps dotting the yard. Once you remove a stump, you can repurpose the space to something that will boost the value of your home, such as a new tree, flowerbed, picnic table or something else to enhance the space. You can also just leave the area clear for children to play around in a safe environment with no tripping hazards or other dangers. If you leave a stump in place, the roots of the tree can occasionally continue growing, harming the environment around them. They can damage pipes, sidewalks, and other parts of your home if not properly controlled. Before the roots finally run out of nutrients and decompose, you can find that they’ve done a significant amount of damage to the area around them. Therefore, it’s best to remove the stumps as quickly as possible rather than letting them sit in place for any length of time. If you have made the decision to remove a tree stump, there are several steps you can take. The simplest way is to have it done when you have the tree removed in the first place. You can do this yourself, however if you are not prepared to do such a job you may find that it a bit overwhelming. Often you’ll find that it’s more cost effective to simply hire a professional tree service to remove the stumps. Professional tree removal services will generally charge based on the size of the stump and the method of removal. They may also charge by the hour. Either way, stump removal will most likely set you back a few hundred dollars. There are several methods that they can utilize to remove stumps. Stumps can be burned to remove them; they can also be ground down, or dissolved chemically. Whichever method you choose, we think that you’ll find removing dead tree stumps is the best option for you.